Companies with social initiatives are my favorite. There’s nothing better than buying something and feeling like you contributed to a great initiative. When Happiness Boutique contacted me for a collaboration, and I discovered that not only do they sell gorgeous jewelry, but their social initiative is to spread happiness, I couldn’t say yes fast enough! I love how jewelry can completely transform your outfit. 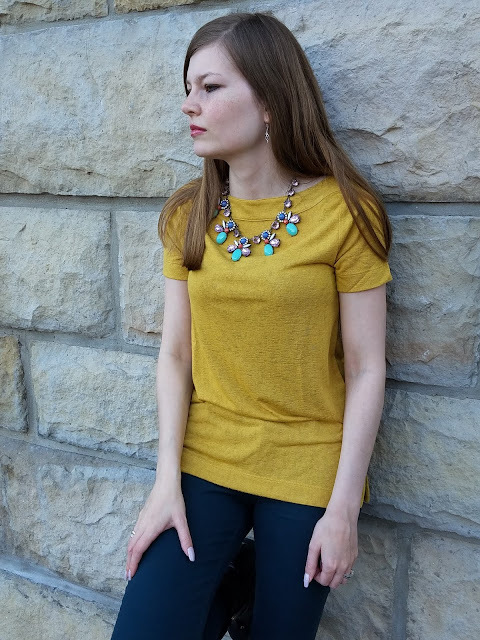 When I searched through Happiness Boutique’s extensive inventory, I was on the hunt for two statement necklaces for the fall: one to wear with casual outfits and another one for going out. It was seriously so hard to narrow my choices down to two when there were so many gorgeous pieces. I even asked Chris for help! With the two necklaces I picked out, I put together three looks perfect for Thanksgiving. This post contains affiliate links. If you click on them, I get a tiny commission! 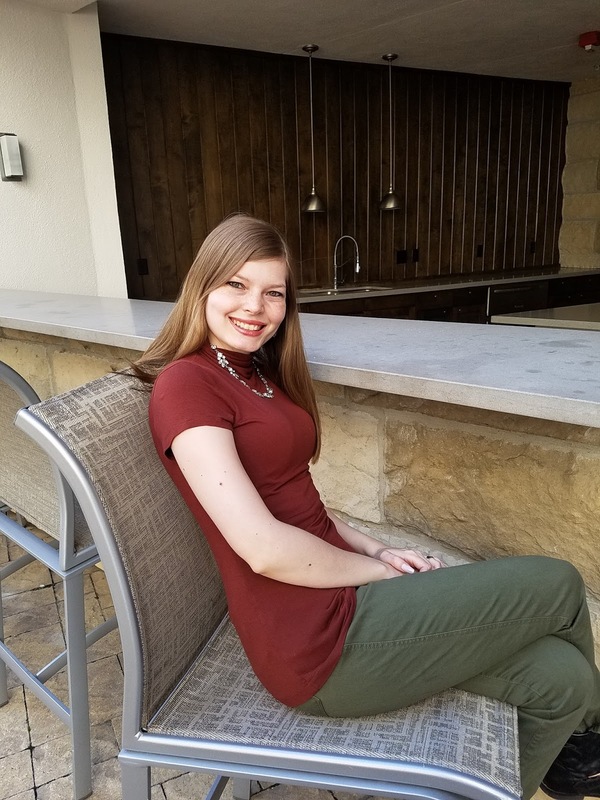 I love putting together casual outfits and dressing them up with a fun necklace. 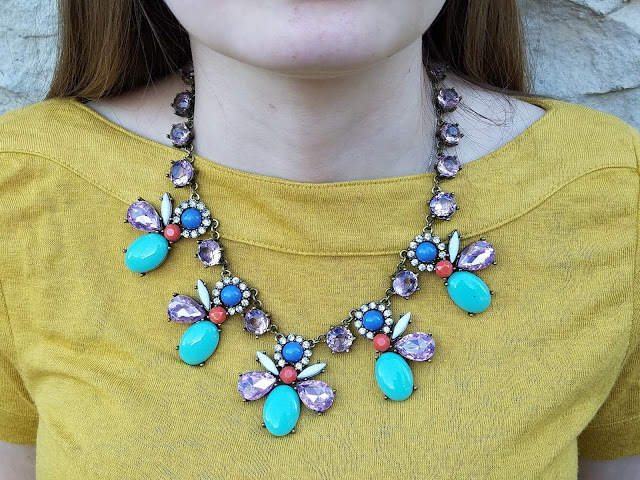 For a casual Thanksgiving, I picked out this gorgeous honeybee statement necklace. I love how it looks with my mustard boatneck tee from Loft (currently on sale!) and my Old Navy Rockstar skinny jeans in glorious pine. I was a little worried because the necklace felt heavy when I first picked it up, but I didn’t feel it at all when I put it on! 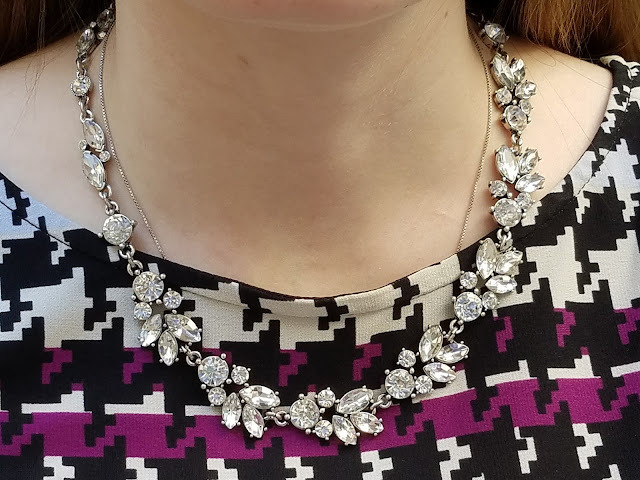 Russian parties are always on the formal side, so I wanted a sparkly necklace to go with the dress I picked out for this year’s Russian thanksgiving. 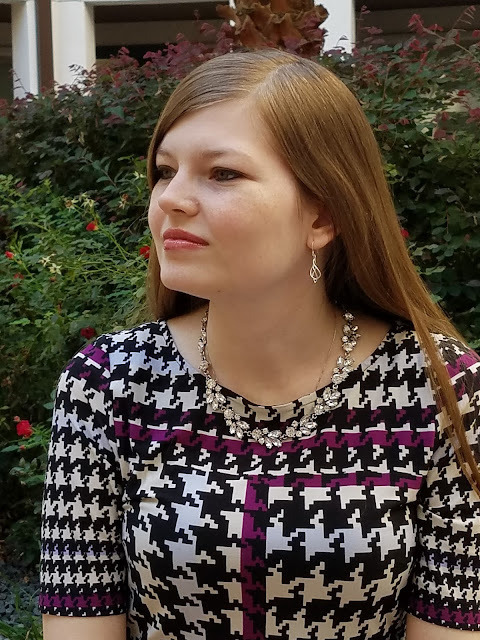 Since my houndstooth dress (similar) is a little busy, I went with the vintage jewels statement necklace. I love how the necklace brings a little sparkle without clashing with the dress. Thanksgiving at my in-laws’ house is the complete opposite of our Russian Thanksgiving. They prefer all things casual, and there’s definitely nothing wrong with that! One of my favorite things to do is to pair a fancy necklace with a casual outfit. 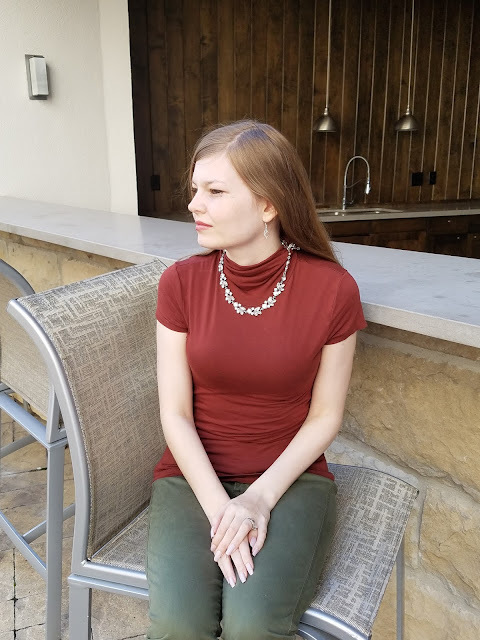 I love how my dainty statement necklace looks with the rust-colored top from H&M (sold out) and olive green pants from JCPenney. Happiness Boutique is based in Germany, but it offers free shipping worldwide. I was impressed by the quality of the necklaces, and I love that they have a customer reward program (who doesn’t like earning free stuff?). 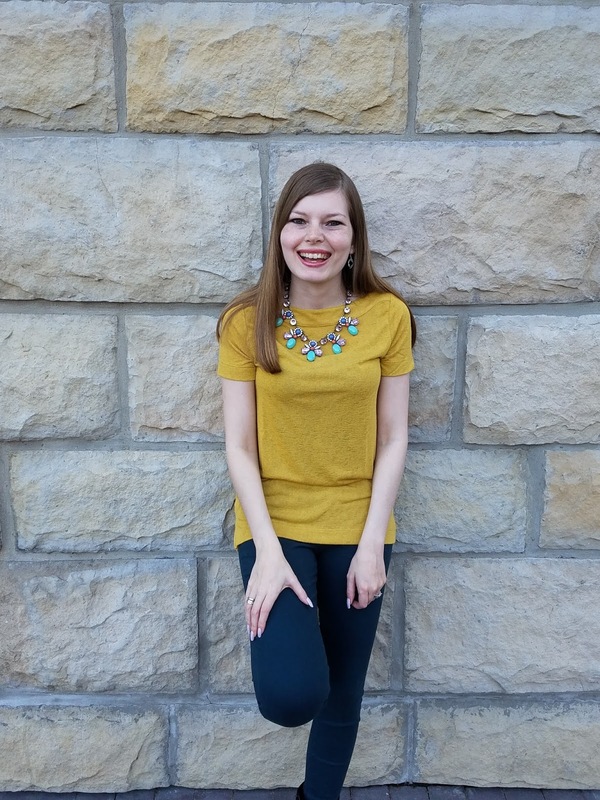 If you want a gorgeous necklace of your own, Happiness Boutique is currently offering my readers 10 percent off with the code thesiberianamerican. I received two complimentary necklaces from Happiness Boutique, but all opinions are my own. I love that top from Loft! All of these looks are great on you. I love all the ideas for thanksgiving! They all look so comfortable :) I'm hoping for a more casual thanksgiving this year! These are so pretty. Love these looks. That mustard top from the LOFT looks great on you! You look so cute in every one of those outfits! I love statement necklaces. They truly change the look of clothes! Love those necklaces! I'm a huge fan of casual outfits with fancy jewelry. 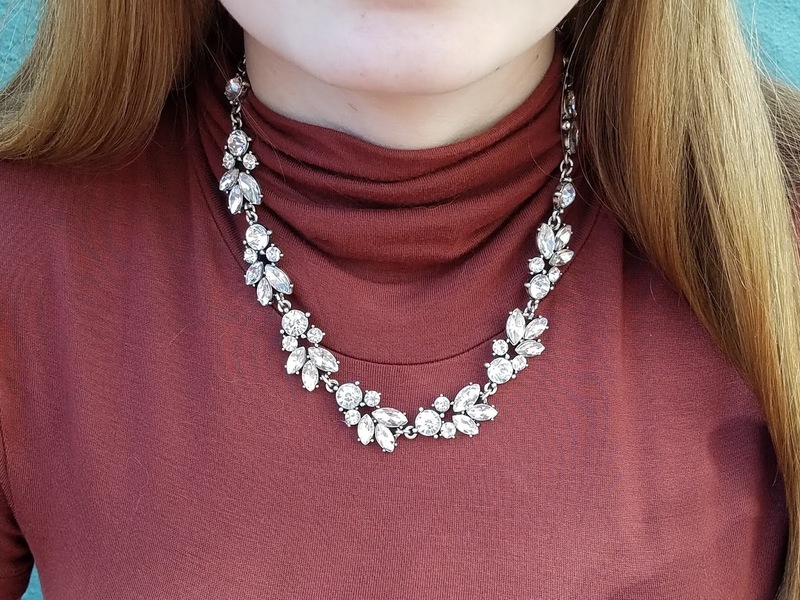 I actually bought a necklace intending to wear it with my wedding dress (before I had the dress--and then I realized it was too much) and now I wear it with casual outfits and I love it! It really is awesome when you find a company that not only produces a great product but also has a great social initiative! That makes me want to shop there anymore! The necklaces you picked out are so pretty, and I love how you added the sparkly necklace to a more casual outfit too! We could always use some more sparkle sparkle in our lives! You are the most gorgeous little model! 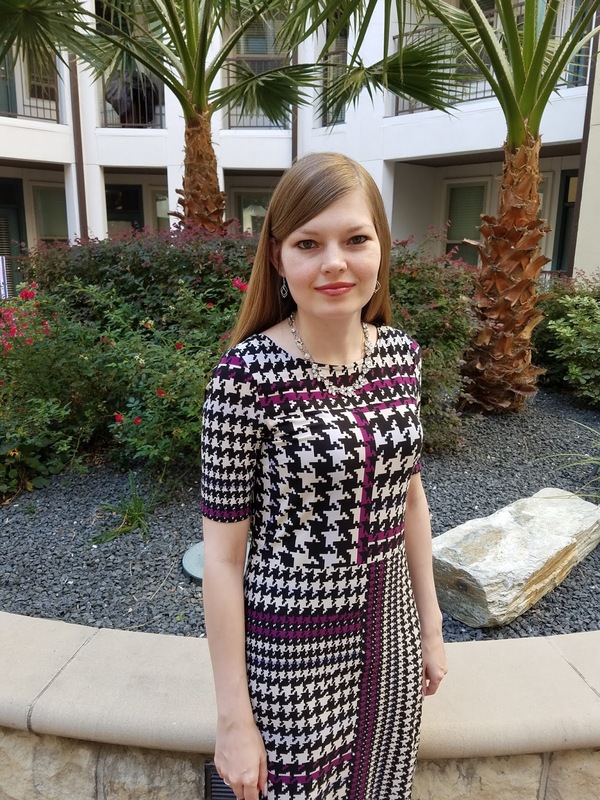 All those Thanksgiving outfits are perfectly styled! I tend to dress more casual, but with a fancy flair since it IS a holiday after all... Haha! I love the pieces you picked out! I am always super casual and comfortable on Thanksgiving. Oh I love those necklaces!! So pretty!! I love how you styled them. Oh I have no idea what to wear on Thanksgiving, so thanks for the inspiration. You look fabulous lady and I love how you styled those pretty necklaces with the Fall-colored tops. I really like the second necklace! And your houndstooth dress is especially lovely! You're adorable. I love the looks! Especially the first one. love all of these!! great pieces! also, sidebar: Old Navy Rockstar jeans are the best, aren't they?! I love them! So pretty! Love you styled these!